> B.A.S.S. officials gave us a big package of maps for Cayuga and for the Niagara River at the same time. It was half confusing, to me anyway. > I was told [his penalty] couldn’t just be a fine because what I did created a competitive advantage to me. I disagree. If I’d kept the [one] fish, that would have been right. But I didn’t keep the fish. I culled it. So I didn’t get any benefit from being in the off-limits area. > I don’t mind being punished. Nevertheless, I can’t help but feel like I was over-punished. > This is not a Bubba sport anymore. There’s real money involved, along with careers and lives. If we’re going to be professional, we need to have procedures like professionals have. 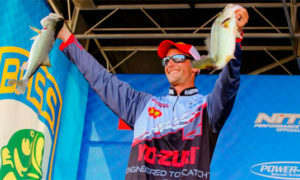 One mistake should not destroy an angler’s season. Hey Hack — this IS a Bubba sport. Even the guys from Michigan say “y’all.” That don’t happen in the RGPFL (Roger Goodell’s Private Football League). 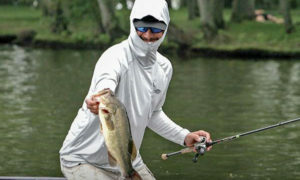 Bassin’ always will be Bubba, right Si? Well, uh, yeah okay Si, that’s cool man. Also saw A-Mart eatin’ some Vi-enny sausages t’other day…. K-Pink and me on what went down. > I wouldn’t consider Greg and I to be close buds, but I know that he’s a stand-up guy. A guy who does it by the rules. Doesn’t skirt around grey areas to gain an advantage. He’s old-school and would rather beat you by just catching more bass. After that he goes all Harold Sharp on everyone. > Yep they all know how to read maps, but what about a chip or a cloud download at the beginning of the season with the off-limits areas highlighted, marked, etc.? Is it really that hard to do? Answer: no — but so what if it was: The Elites collectively are one of B.A.S.S.’s biggest customers so…. > This whole “oh my gosh a violation!” [so don’t talk about it] rules thing got screwy back when ESPN didn’t know what it was doing and one (or two) of the prior FLW regimes was so paranoid about the Wally-Mart relationship that they buried rule violations in some dump in Minneapolis. > Let’s get over it already. Another way to say it: Does it make any kind of sense that Hackney is the one who wrote the story on his own violation?? It’s a friggin’ meme fiesta! What else Hack does you shouldn’t do. > I change my outboard motor prop after every 10 or 12 days of tournament fishing. If the one I’m using gets even a little bit dull, it’ll cost me 1 or 2 miles per hour. That’s several casts a day and maybe as many as a hundred over the course of a season. > If I’m fishing a crankbait, I change the hooks several times a day. Even running them through open water will dull them. Water’s abrasive so it counts too. Evers and Reese do office flippin’. Bring your rod to work day? What ICAST does to you. 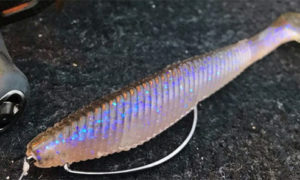 More ICAST new bait/gear stuff coming in future Blasters, stay tuned…. 1. One of the Baton Rouge officers was a bass-head. RIP and thank you for your service bassin’ brother. 2. Guido Hibdon getting cancer treatments. Colon cancer. Pray for the #legend. 3. Evers punches catfish that stole his wallet. 4. FLWer Bryan Schmitt on BassEdge Radio. 5. 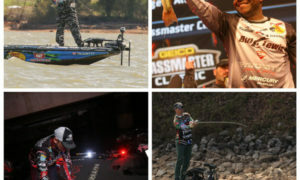 2017 FLW Tour schedule announced. Beaver’s still there, but Travis, TX and Cumberland, KY are interesting. 6. 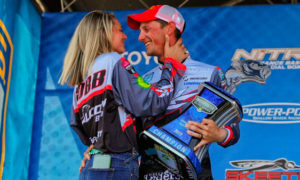 MLF says it is the #1 fishing show. > Contributing to the show’s top billing is the sheer volume of exposure — more than 1,700 hours of episodes have been logged since its beginning. 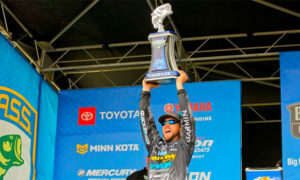 For 2016, MLF has more than 500 hours in programming airing on four networks, including World Fishing Network and Fox Sports 2, along with CBS and Outdoor Channel. Good show but betting that’s a lot of the reason. 7. Two outdoor media legends honored. 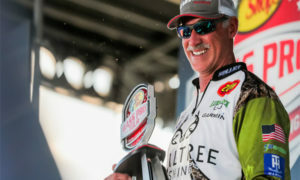 Long-time Bassmaster Mag senior writer Wade Bourne got the Homer Circle Award for pretty much being the best at everything he’s done in this biz, and Steve Quinn of In-Fisherman got into the Freshwater Fishing Hall of Fame…thanks to a generous donation by a certain Mr. Quinn Stevens. HAHAHA just kiddin’ Stevie, I need an autographed calendar man! Both great guys — congrats! 8. IL: Make bass found to contain eggs. Yuk. Sounds like the problem is spreading nationally. 9. KY: Basser finds stolen truck with electronics. 10. FL: Jags’ OL Tyler Shatley likes to bass. “When it’s not too hot,” he says. Guess that’s just during football season then? 11. New Loomis GLX bassin’ rods. > …35 new GLX bass rods (20 casting, 15 wuss), offered in lengths, powers and actions for jig and worm, all-around G. Loomis Mag Bass, spin jig, flip-punch, ShakyHead and drop shot fishing situations. 12. Roll your own Yamamoto Senkos. Do-It Molds has new molds for 4″, 5″ and 6″ Senkos — the real deal. Looks like Tackle Warehouse has the 5″ mold, the others available in the fall. 13. Bass U: Faircloth on summer/fall veggies. 14. Lowrance’s parent bought by funds. > Goldman Sachs and Altor Fund IV partnered and are acquiring Navico Holding AS, parent company of the Lowrance, Simrad, B&G and GoFree brands, from the Altor 2003 Fund. Altor seems to be “Nordic”-focused funds, and Goldman Sachs is too big to fail, which means you get almost-free money from the U.S. gov’t among other perks…. …and Goldman Sachs, sounds like. > His Phat Frog comes with a glass rattle chamber, but when he needs to give the fish a bigger dinner bell, Monroe will locate the rattle inside the bait, hold it between his fingers and then use his pliers to crush the glass container. More pieces equals more sound. > Other sound-enhancements: Temporarily remove the frog’s legs and shove rattle chambers or loose BB’s into the body and then replace the legs. Add a jig rattle to each shank of the double frog hook (make sure the additions hang below the shanks to prevent impeded hookups). Hang spinner blades from the hook shanks to add thump as well as flash. > …adding lead BBs will make a frog heavier for a twofold benefit. First, increasing weight increases casting distance — a benefit in high visibility and/or pressured areas. > Also, the more a frog weighs, the more it displaces vegetation and the deeper it sinks. This allows bass to better track the bait across thick canopies and, frogs that sit lower in the vegetation, are more easily reached. It was the worst piece of advice that I ever got. 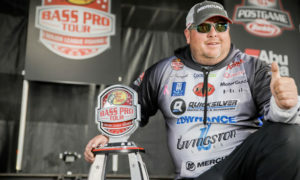 – Keith Combs talkin’ ’bout the time his cousin/first team partner told him to stop fishin’ cranks because Keith stunk at it. > Sure, a largemouth in California may be distantly related to a largemouth in Florida, just as a smallmouth at Erie may be a long-long-lost cousin of one at Havasu. They certainly share some basic habits. But when you start to treat them as if they’re the same, you’re going to get burned. > Prior to traveling up north that first time, I’d always heard about the magical Ticonderoga section of Champlain and its fertile grass beds, but when I got there they threw me a huge curveball. In the South, when you flip grass, the fish are usually relating to the edges. In the North, you have to get up in it and flip it all. When you finally get bit, there are usually others around it. They may be relating to some sort of bottom change, but it’s not necessarily an edge. Interestin’. But here’s the deal: A bass IS a bass as long as you’re comparing ’em in the same WATER BODY TYPE, of which there are only five. Meaning a highland rez in California will fish pretty much exactly the same as one in the Ozarks or Virginia. You’d know this if you used BassGold — but don’t subscribe yet. We’re still retooling it….